With canoeing being hailed both the UK’s biggest participant watersport for the fifth year running and also its fastest growing watersport there is clearly something for everyone with this exciting and addictive activity. As canoeing is almost as old as mankind itself it is not surprising that in its considerable lifetime many different ways to enjoy the activity have emerged. Canoes and kayaks can be used to paddle down mountain rivers, crash through fierce white waters and roll across ocean waves. They can join a huge variety of sporting competitions or used to leisurely tour a city’s waterways. Whether young, old, adventurous or not so, canoeing has something that appeals to all water babies. Canoeing and kayaking are essentially the same thing but are differentiated by the type of vessel used. 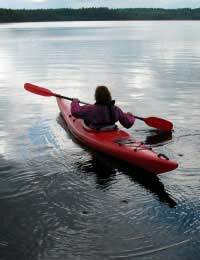 A kayak is a type of canoe which is designed for more active pursuits. For instance it enclosed decking allows boater to travel across rougher waters. There are three main types of canoe – the fast-turning kayak, the straight-running kayak and the open canoe. The fast-turning kayak is for seasoned adventures not afraid of being tossed about by raging river torrents. It is an extreme sports vessel specifically designed for rough waters, and is relatively slow for cruising along calm waterways. It is the shortest canoe at between 3 and 4 metres in length. The straight-running kayak is designed for more leisurely cruising and has a large roomy cockpit for comfort for long periods on the water. It is usually a similar size to the open canoe of between 4.5 and 5.2 metres in length. The traditional open canoe is so named because the vessel has no deck enclosing the boater. It is reasonably manoeuvrable and, unlike the kayak models, it is controlled by single bladed paddles. Canoeing offers a remarkably varied range of activities, from competitive sports to journeys of exploration. There is a wealth of opportunities for all types of people from touring and recreational canoeing, competitive canoeing, marathon, sprint racing, canoe polo, slalom, sailing, wild water racing, sea kayaking and surf. The most popular and wide-ranging of these disciplines is touring and recreational canoeing. This is suitable for all abilities because its level of difficulty is dictated by the boater and where they want to paddle, from the relaxing joys of cruising down slow flowing rivers, canals and lakes to the edgier thrills of negotiating mountain streams. Many recreational canoeists, who feel confident in their craft but want more challenges, progress to sea kayaking or wild water racing. Sea kayaking introduces the unpredictable and sometimes unforgiving environment of the open sea, where the canoeist has to learn to understand the weather and tides. Wild water racing is a test against the clock of competitor craft, skill and courage on varying difficulties of white water courses. The British Isles are ideal for canoeing as there is a superb variety of water to choose from. Rivers, canals and lakes offer easy touring on calm waters and also fiendish some white water descents. The narrow wooded waterways of the Shropshire Union Canal and the spacious waters of the River Severn are two great examples. The coastline of Britain also provides superb canoeing water, often with spectacular scenery, such as the east coast of Anglesey with its stunning view of the Snowdonia Mountains and north coast of Cornwall. Canoeing and kayaking does not stop outside of British waters either, as there are a host of opportunities in the seas and rivers beyond, from paddling around the islands of the Stockholm archipelago, through cityscapes like New York and Berlin and sea kayaking along the wild coast of Alaska. The best way to start is by joining a local club or group as it is fun, safe and an easier way to master the basic skills. The British Canoe Union (BCU) publishes regional lists of Affiliated Canoe Clubs and Approved Centres on their web site www.bcu.org.uk, and many of these offer special sessions and courses for newcomers. Activity holidays also provide a great introduction to canoeing. BCU is the governing body for canoeing and kayaking in the UK and was set up in 1936 to send the British to the Berlin Olympics. Since then the organisation has grown considerably, and the range of canoeing opportunity has increased tremendously. The BCU has an Access Officer in each region who can advise about local canoeing waters. Canoeing and kayaking offer the quickest, cheapest and easiest way to get out and get active on the waterways and seas of the UK and with its popularity soaring there has never been a better time to join in the fun.